2004 Chess Olympiad: Philip Corbin produces 24-move shocker! The 36th Chess Olympiad got off to an inauspicious start for the teams from developing nations, but as usual, fireworks were ever-present in the first round. 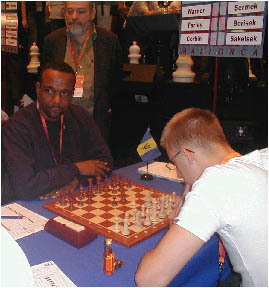 In the first round, Barbados faced the host of the 2002 Olympiad, Slovenia. According to Ian Wilkinson, teams from the Caribbean added to the festivity by displaying the colors of their country. Barbados' Dr. Philip Corbin, known for his attacking style, added his own color with a 24-move rout of IM Tadej Sakelsek. 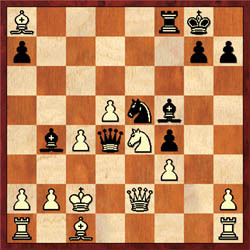 Employing the "Elephant Gambit," Sakelsek apparently had no idea of Corbin's style and went head first into complications with his king in the center of the board. Corbin is an Olympiad veteran and Sakelsek should have done better preparation. After sacrificing a rook and two pawns, Corbin unleashed a vicious king assault that left his opponent stunned and beleaguered. The Slovenian ran his king to find shelter on the queenside. With the black pieces bearing down on white's passive position, Corbin hit his opponent with a game-ending combination to the delight of bystanders watching the game. It was another Corbin moment. The speed in which Corbin's attack accelerated after 12…f5! was impressive and thereafter, Barbados would score their first point of the Olympiad. Despite a 3-1 loss to Slovenia, this win will do much to make Barbados and the Caribbean proud. The "Caribbean Tal" strikes again!